And so on the move again. Twelve days in Mongolia, although we could easily have spent more. 'Next time' we say. This time we have already spent more time than we planned, in fact plans are now going the way they were always expected to. They are crumbling around the reality of experience. We created a project plan before leaving the UK. This project is over budget, over time and gloriously so. We are expected to enter Vietnam on 15 June, we will do no such thing. China will occupy us for the full duration of our visa - one month. We'll be in Vietnam late. And will extend our Vietnamese visas in Hanoi. And our plans may further change in time. India, our goal is looking like she doesn't want to play. She is throwing all her toys out of the pram, with her antagonistic sister Pakistan winding her up. The UN pull out non-essential staff; both countries governed by stubbornness are sizing each other up. Come on then if you think you are hard enough. Like two drunken fools outside a nightclub, sizing each other up for a brawl. Only this will be no street fight, this will be a toasty affair, hot and spicy with the potential to leave both nations suffering from sickness considerably worse than Delhi Belly for many years to come. But I am waffling, and am ill informed. News is but an occasional entity that filters through to us. Our only reality is the immediate present. Another train, another carriage, Chinese this time on the tracks heading east. Destination Beijing. We rattle across the Gobi desert. It is not so much a desert, more a rough rocky landscape with a sandy covering interspersed by tough hardy tufts of grass. I'm looking out of the window watching the distance markers vanish into the distance. every kilometre on the route is marked on a post by the side of the tracks. Some of them are easy to see, others are too close to the tracks. And when we travel at speed they flash by too quickly to read. The guidebook provides points of interest for many of these markers. Given the bareness of the Gobi there are not many points of interest. I'm now just waiting for the marker for 733 KM where we will see a pond that often is a watering hole for camels and gazelle. and I'm looking out of the window, craning my neck, watching the markers flash by and then we are at 733km and is that it? Seemingly hours of this produce a crooked neck and the 'pond' is no more than a muddy puddle and the interesting wildlife is no more than dirty water buffalo that were two a penny in India. The desert stretches for miles, it is the chariot upon which it's master, the blistering heat, rides. The temperature has steadily increased since Ulaan Bataar. The intense heat is smothering us like a giant duvet from which we cannot emerge. The fan barely cuts through the dense air in our compartment. The air is double cream, thick and difficult to pour. The fan just whips it into small air pockets that lighten it, but it is cream all the same. And man cannot breathe cream. Temporarily, I escape this atmospheric sludge in the world of dreams. I fall asleep. To awaken in a pool of sweat. My shirt sticks to my back. I am drenched, evidence of the body's futile attempts at cooling me down. this is dreadful. I try to open the window but it is locked. The carriage conductor refuses to unlock it. He points at the unforgiving dessert outside then wipes his fingers on the window frame. It is thick with dust. He refuses to allow us to replace the environmentally nastiness of the heat we are suffering with dust which I am sure we would find more acceptable. The rub is ‘who would clean it up afterwards’? I suppose mopping up sweat on seats is considerably easier than sweeping out dust from nooks and crannies... and so we suffer as the train clickerty clacks across the desert, on and on to the Chinese border. So this is China. The border officials are friendly and courteous and the ink dries on a couple of fresh new stamps in our passports. Yes, we'll admit it, the real reason for this trip is to fill up the little burgundy books with as many visas, entry and exit stamps as possible... to make that annoying ritual of 'let's have a look at your passport photo' a little more entertaining... to be somewhat aloof, 'yes, I suppose we have traveled to a few places..."
Just over the border the train is shunted into a huge shed and the carriages de-coupled. 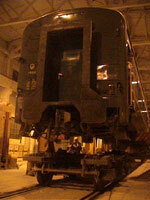 Each carriage is raised up above the bogies by pneumatic lifts and the bogies are wheeled away. China's rail tracks are a different gauge to Russia and Mongolia, hence the change. It is 1am and an interesting sight, seeing our carriages floating in the air with no wheels below them. Almost naked whilst the train crew hurry below pushing the old bogies out and new ones shoehorned in. We are tired and getting more than a tad annoyed at being followed around everywhere we go by an odd Italian. And then our conversation finishes and what is he doing now? He is smelling things. Like an animal would. Not just a quick sniff, no, three, four, five large gulps of sniff, each getting louder. He's sniffing his book, his passport, and his camera. We've got a weird one here!!! And now he is following us up and down the bogie-changing shed. ‘GO AWAY’! Cries Lindsey.